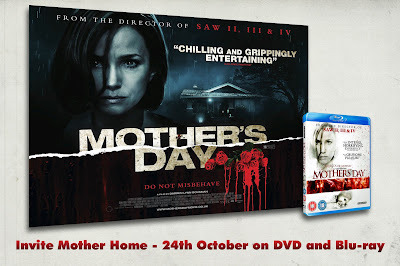 To celebrate the 24th October UK DVD and Blu-ray release of Mother's Day (Studiocanal), we are offering a fantastic original cinema poster and a copy of the film on Blu-ray. Rebecca De Mornay (Wedding Crashers; Lords of Dogtown) heads a killer cast in Mother's Day, in a role the makes her psychotic character from The Hand That Rocks The Cradle look like Mother Theresa! Loosely based on Charles Kaufman’s 1980 Troma classic, Mother's Day is a nail-biting thriller that has been described as ‘intense’ (Dread Central) and ' a gruesome pleasure" (The Sun). Thanks to our friends at StudioCanal, we've got two copies of Mother's Day on Blu-ray and a cinema poster to give away! For your chance of winning, send your name and full postal address to emotionally14@hotmail.co.uk before midday on Thursday 27th October, making sure to put "Mother's Day" as the subject. The first entry out of the electronic hat after the competition closes will receive a copy of this awesome Blu-ray and a cinematic poster, with one runner up receiving a Blu-ray! Don't forget to put "Mother's Day" in the subject line. Incorrectly labelled or blank entries will be discarded. Mother's Day is available from Monday 24th October, courtesy of StudioCanal.